Cloudy this morning with showers during the afternoon. High around 55F. Winds NW at 10 to 15 mph. Chance of rain 60%..
Cloudy skies early, then partly cloudy after midnight. Low 46F. Winds NNW at 10 to 20 mph. 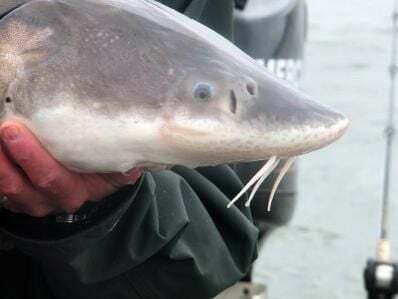 The number of legal-sized white sturgeon (38 to 54 inches in fork length) in the Columbia River downstream of Bonneville Dam declined in 2018, while the number of sturgeon large enough to spawn (over 65 inches FL) — adults — remained steady from 2017 numbers, according to a 2018 report by the Oregon Department of Fish and Wildlife. Legal-sized sturgeon — those large enough, but not too large to fill a legal slot allowed for fishing — declined 19 percent from 2017 and was 28 percent lower than the peak abundance in 2016. In 2018, biologists say there were 162,182 legal-sized sturgeon (63 percent of the conservation status level) in the river downstream of Bonneville and 6,108 adult-sized fish (three-year average is 7,493 fish and the desired abundance is 9,250 fish, while the conservation status threshold abundance is about 3,900 fish). Both sizes of sturgeon, however, have abundances that are “firmly above conservation status,” the report says, an abundance that could allow fishing this year. Tucker Jones, Ocean/Salmon Columbia River program manager for ODFW, remarked on the status of white sturgeon in the lower Columbia River and lower Willamette River last week, saying h’s not certain why young of year recruitment is down, but one thought is predation by steller sea lions. Ultimately, there could be fishing for white sturgeon in 2019 similar to the last couple of years’ sport and commercial fishing set by the Commission, “but that’s somewhat dependent on Commission guidance,” Jones said.